The dimensions are 800mm x 800mm x 200mm. This fire uses a mini burner, which has a fuel capacity of 1.5 litres and burns 1 litre every 4 hours depending of the setting. The heat output for this fire is 1.9KW. 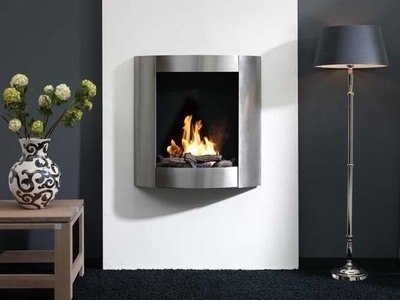 The Bio Flame HH is our most popular hang on the wall fire and it isn't hard to see why. The HH is a perfect focal point for a modern home. The HH uses a unique burner with a patented ceramic core. The bio fire burner is constructed from steel and employs a porous ceramic block to store the bio ethanol fluid. The porous ceramic soaks up the bio ethanol like a sponge and then releases it in a controlled manner when required. This bioethanol burner is TUV approved and is one of the only bio fire in Europe with a TUV safety approval stamp. The fire is lit with an extendable lighter and extinguished using the sliding mechanism so you don't have to stick your hands in the flames. This fire pit can be dressed with ceramic logs (as shown in the image above), pebbles or our unique Black Diamond material. Please note: This fire is not a stocked item, it is made to order and as such isn't covered by the 7-day cooling off period.